Anything I’ve made on the blog can also be made for you. 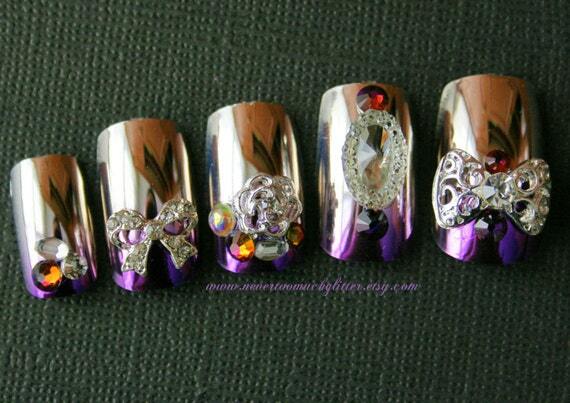 I can custom match the nails to a dress, flower, piece of jewelry, etc. Unfortunately, I cannot ship bottles of handmade nail polish at this time, so I’ve been making designer press-on nails. They’re just like drugstore press-ons, but thinner, smaller and more natural-looking. Of course the colors are crazy! The tips run small as they’re from Japan- best for petite to medium sizes. 22 nails in 11 sizes on each set. Reusable with double-sided tape, or wear for up to a week with nail glue. I’ve expanded to larger sizes and shapes from stiletto, oval and square. I’ve even expanded to guy sizes for you adventurous fellows. 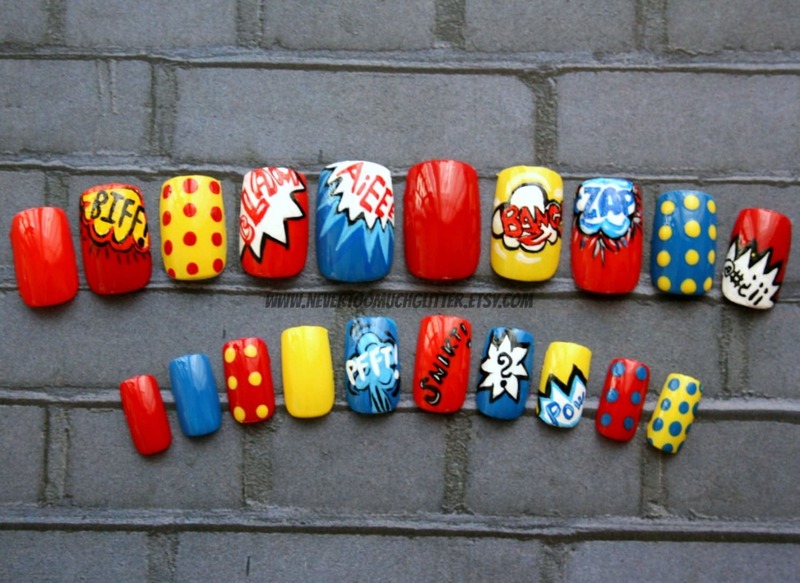 Check out the store for all things nail-related in a variety of styles. 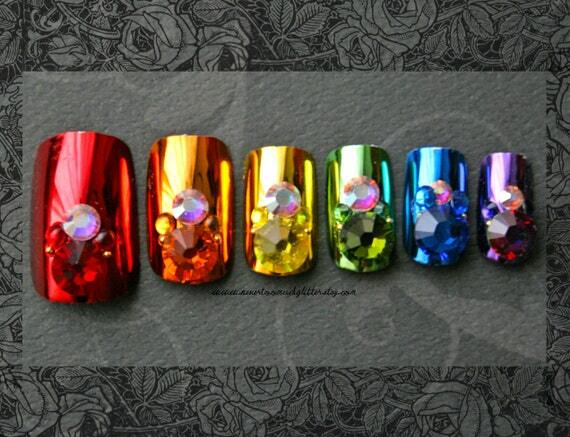 12 Responses to NTMG Online Nail Shop! 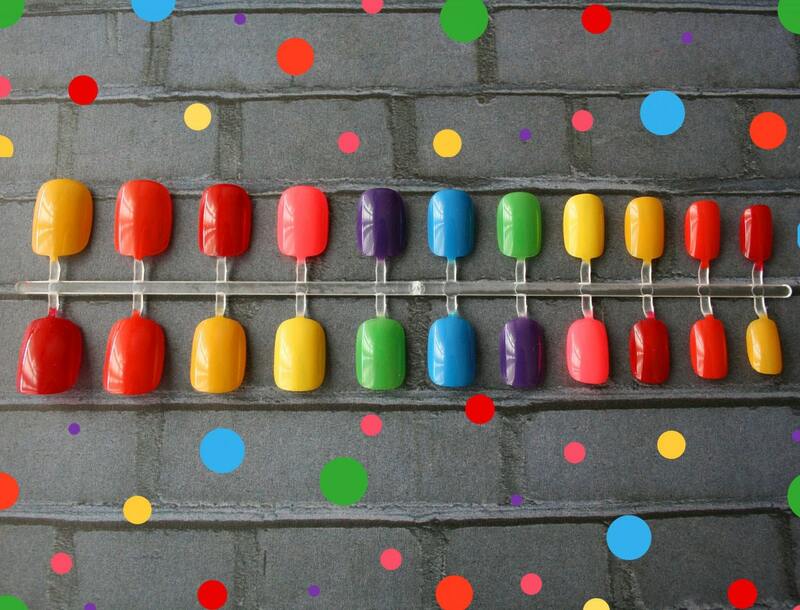 When do you think you can start shipping handmade nail polish? I love your frankens! Thanks Tara! The US and EU forbid polish to be shipped by air. Sea mail would be OK, but it takes forever from Japan. The biggest issue is that I can’t identify the ingredients in the polish, since it’s homemade, and it’s technically not allowed to be sold without the ingredient list. I’d feel really bad if someone had an allergic reaction to my polish. I’m trying to work around it though- maybe find a lab technician willing to test my polish in exchange for as many frankens as they want?! I was reading some old post and is it still possible to get TiNS nail polish through you? I did a special trade with a long-term reader, and do very occasional swaps. but I’m not able to supply TiNS regularly. In fact, I did find out after a warning from the postmaster that it’s illegal to send polish through the mail. That’s why my webstore only has nail tips and no polish. Sorry! oh hai! just wanted to say that i stumbled upon your nail blog and i quite enjoy it – most nail blogs (while pretty to look at) lack hilarious and witty commentary/stories.. i really like that about your blog. i would also ove to see you attempt galaxy nails (i know its a bit overdone). cheers! Thanks for stopping by! 🙂 I do have a pretty odd sense of humor- glad you appreciate it! Galaxy nails….hmmm. Let me see what I can do! I was reading some of your other posts and I am still wondering where I can get some gradation liquid. I found some gradation kits at Wal-Mart here in the US from Kiss, but I would prefer to try the liquid for more color choices. I wonder why it is so hard to find here in the US? All web searches turn up is images. I am beginning to think if someone was to find a way to supply here in the US, they could make a fortune. It’s quite expensive in Japan, over $15 US and is tricky to get the hang of. 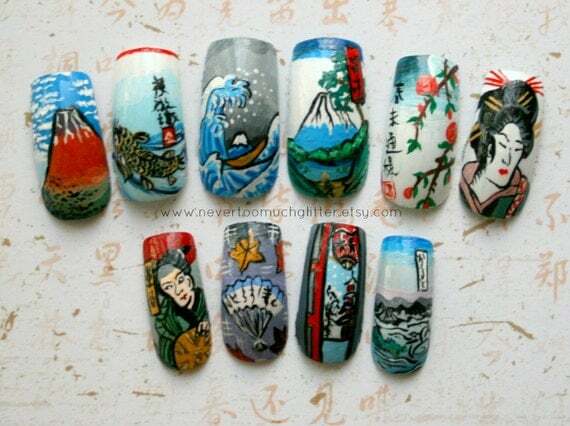 The Japanese do have a lot of really unique nail products but I think in part because they’re willing to pay a higher price for goods in general. I wish it was easier to find too, though!